Ever wondered what to do with a bag of milk that has started to separate, thicken or gone sour in your fridge, or leftover buttermilk? You can turn either it into glums (dry cottage cheese) or mix the tow and have even tastier glums (dry cottage cheese). This simple recipe is perfect for whatever amount of milk and or buttermilk you’ve got left because it takes no additional ingredients. You don’t even need to measure anything. All you have to do is pour some milk, buttermilk or both into a pot, heat it for a few minutes, and let it sit. First you heat the milk/buttermilk on low heat. It begins to form a curd, even with no added acid. The curds will continue to form. It only takes about 5 minutes. Strain the glums (dry cottage cheese) through some cheesecloth or a clean cotton cloth. 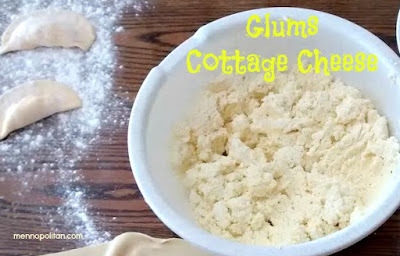 Growing up we often made glums on the middle holiday during the three holidays at Christmas, Easter and Pentecost. The Mennonites didn’t run the cheese factory during the holidays so everyone would make glums at home instead, so the milk wouldn’t go to waste.